Do you need help staying strong in the face of bullying? Are you working to succeed in business? Is it time to ‘adapt or die’? 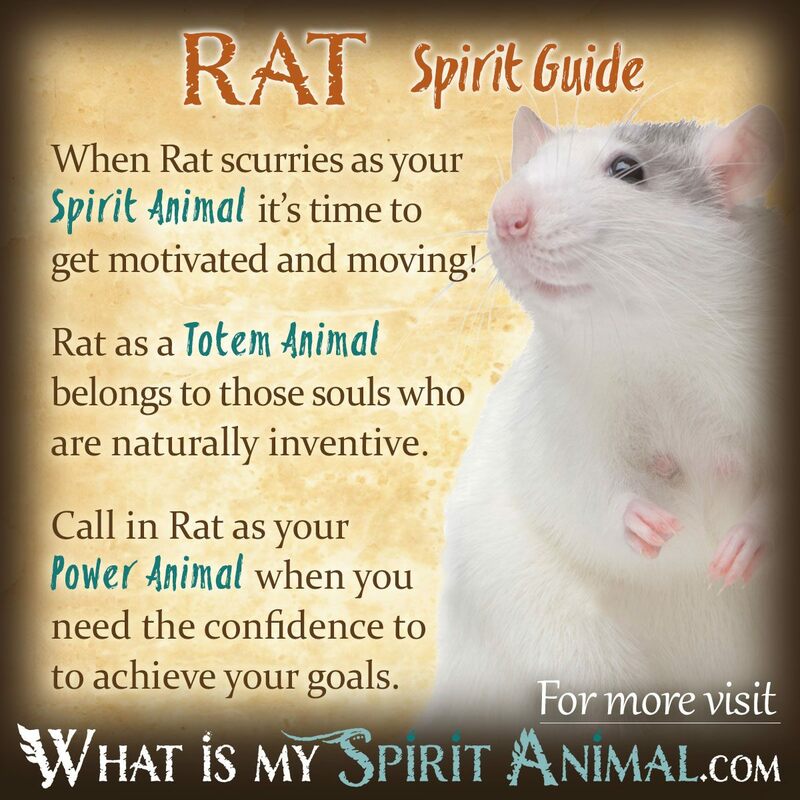 Rat as a Spirit, Totem, and Power Animal can help! Rat teaches you how to tap into quick-witted solutions and the importance of adaptability. Delve deeply in Rat symbolism and meaning to find out how this animal spirit guide can support, assist, and inspire you. Most people want a regal or impressive spirit animal guide like a glorious Horse or powerful Lion. So when someone comes face to face with Rat energy their first reaction may be, “well, Rats!” This negative reaction is understandable but I hope you’ll take some time to get know the Rat. This creature is an incredible survivor despite being one of the two most hunted animals of prey (Rabbits being the other). Additionally, it could certainly be argued Rats (like Snakes, Spiders, and Possums) are among the most feared, hated, and misunderstood animals on the planet. But Rat symbolism and meaning is profoundly beautiful and deeply meaningful in a number of ways. The ancients in many cultures associated the Rat with spreading disease and times of blight or famine. Take for instance the Bubonic Plague (aka The Black Death). For over 8 centuries the Black Rats of Europe have been blamed for spreading the disease which killed over 50 million people. Though unwittingly, Rats were hosts for the infected Fleas which spread the plague like wildfire. As an aside, there is new climate evidence which suggests Gerbils might have been the real culprit. Now, clearly, a Rat would have no way of understanding that it played a part in precipitating a terrible tragedy. Nonetheless, humans have condemned them for over 8 centuries. From a symbolic standpoint, this is huge. See, what really matters here is how Rats have continued to survive despite public opinion – despite the war against them. This is particularly important for those who wish to succeed in business. No matter how dire the circumstances Rat Spirit endures for many reasons the biggest one of which is resourcefulness. These creatures move into the corners and cracks of reality scavenging whatever they need from what the rest of the world leaves behind as useless. In this respect they are the ultimate recycler and symbolize clever re-purposing. In the Asian cultures Rats are considered auspicious symbols of good fortune in business. Rats are highly adaptable and relentless when trying to solve a problem (like finding its way out of a maze). Rat energy is not persnickety. It recognizes needs vs. wants, choosing the former (while also yearning sometimes for the latter). People who work with Rat spirit often love the beautiful things in life but recognize that essentials must come first. And if from time to time Fortune smiles with a gift, it’s held close to the heart like a treasure, kept safe for needier times. Finally, for all the reasons already stated (and those below), anyone whose career puts them in the public eye, Rat energy and medicine is a tremendous ally. When a Rat appears as your Spirit Animal comes it often brings a message about careers. Have you gotten lazy? Alternatively are you working too much and forgetting hearth and home? In either case Rat comes prepared to help you by offering foresight, adaptive ability and directing change toward a creative solution. Just because the Rat is small, do not think it’s tiny in power. In fact, a Rat Spirit Animal may be telling you to take back your mojo and defend your territory. Either that or Rat warns that your situation is sinking fast and it’s time to get out! To discern which, watch the behavior of your animal spirit guide. The more urgent they appear, the more likely it is that the time to move is NOW! You should also pay attention to which direction your Rat Spirit Animal was moving. Was it North, South, East, or West? Was it toward or away from you? All these details matter when decoding the symbolism and meaning of the message. Rats are tremendous nurturers. They diligently tend to the sick and injured of their family. Is Rat trying to tell you to take special care of your family at this time? Who is your family, your tribe? What can you do for them at this moment? While most are completely creeped out by Rat’s long, scaly tail, it’s precisely that tail that allows Rats to have tremendous balance. Are you firmly balanced now or do you need to gain a more solid footing? When you have Rat as your Totem Animal you are the ultimate master of your environment, be it a castle or a cave. The Rat’s ingenious nature doesn’t simply apply to the physical realm however. You can also apply Rat Totem energy to your mind and spirit for foresight, developing instincts and overall cunning. People with the Rat Totem Animal are rarely surprised but they are always surprising others. Be aware, however, that bearing a Rat Totem often leads to a gypsy spirit. You may find yourself fidgety, and wanting to pack up with your dearest possessions for the great unknown. There are ways to temper that, particularly by carrying a crystal known for grounding energies. Rat people are generally super social. They enjoy being surrounded by their friends and family. Those with a Rat Totem Animal enjoy meeting new people and exploring new cultures. Call on Rat as your Power Animal when you have a strong drive for achievement. If you’re starting a new business or partnership, ask Rat to come in as your animal spirit guide and show you how to make adapt and thrive – even through the lean time. The intelligence of the Rat combines with their quick witted nature to seek out the best leads, deals etc. – without over-encumbering the endeavor. Especially important, when you think you are too small to make a difference – or the organization is ‘small’ therefore not very important in the grand scheme of things – let Rat as a Power Animal help you to believe in the Butterfly Effect. You never know what kind of impact you’ll have on this big ol’ world. One small gesture today can cause a tidal wave of goodness all around the world. Finally, if you’re feeling down Rat as a Power Animal can help you laugh and find the joy in life. In Shamanic traditions the Rat speaks of security and survival. The smallest scrap gives Rat Spirit enough to get buy for a little while longer, living on wit alone. Rat can be an interesting partner for protecting one’s health because it has strong immunity to disease and toxins in the environment and food. While Rats were sometimes used as harbingers in Celtic realms, for the most part folklore paints them in a negative light. Siting a white Rat is about the only positive sign noted, indicating good luck. By contrast finding Rat-chewed items prefaced misfortune. There are some contiguous themes, however, that present themselves in other cultural settings. These include leaving a ship before it sinks (foreknowledge) being able to find what they want (cleverness) and defending that aggressively (courage). The way in which you interpret dreams with Rats ties directly to what they’re doing in the dream. If they’re running away it’s typically a warning of some type of storm on the horizon, for example. Rats chewing on ropes represent worries or frets, often related to relationships. Learn more about Rat Spirit by reading Rat Dreams and Their Meaning on WhatIsMySpiritAnimal.com! In the Chinese Zodiac, the Year of the Rat is the first year of the zodiac and is a terrific year for business prosperity. The Year of the Rat bring stability and fast forward movement. Visit my sister-site, BuildingBeautifullSouls.com, to read all about the Rat Chinese Zodiac Sign. Thank you for this lovely article , I looove rats! I moved here mid December 2 years ago ….went out for solstice celebration and when I came back, found dead rat in the middle of the place!